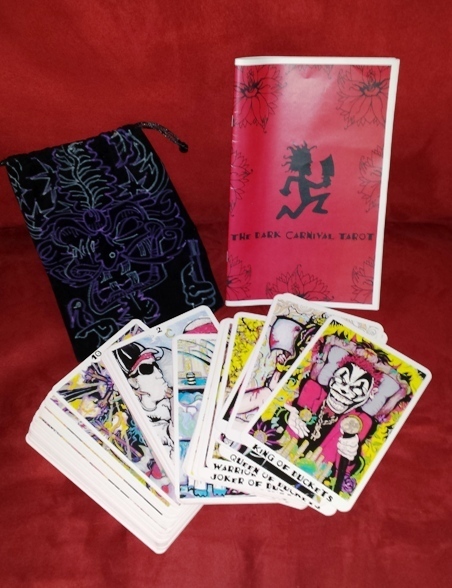 78 cards in a hand-painted black drawstring bag, accompanied by a self-published, 56 page softcover booklet with a red and black cover. 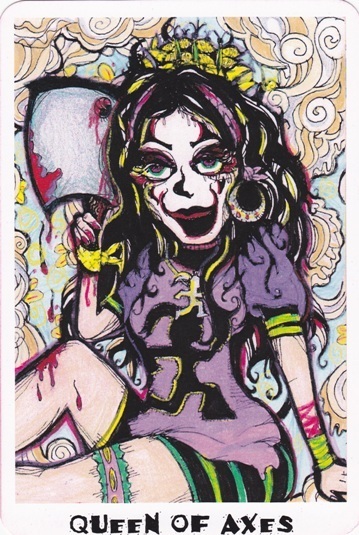 The cards are very large, measuring 15.1 cm tall x 10.2 cm wide, or about 6 in tall x 4 in wide. The backs are red, with a non-reversible black floral motif in the centers. When the deck is held together in a block, the card edges appear reddish, but I think this is an effect of the backs being red. Suits are Gats (Wands), Faygos (Cups), Axes (Swords), and Duckets (Pentacles). Courts are Joker (Page), Warrior (Knight), Queen, and King. Strength is 8 and Justice (titled The Pendulum) is 11. The Fool is numbered 0. The minors (2-10) are numbered, but not titled (so the suit associations can be discerned only by looking at the art. They are fully scenic. 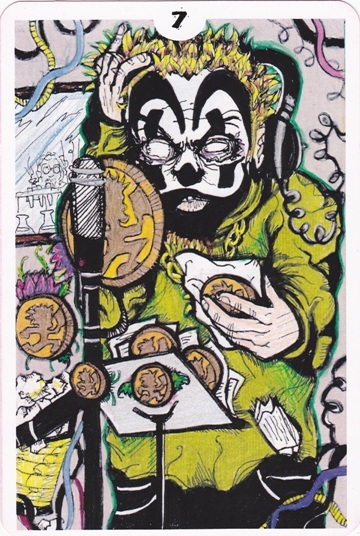 On the one hand, this is the only deck I've seen with a Juggalo theme. On the other hand -- well, I find the deck peculiarly abhorrent. 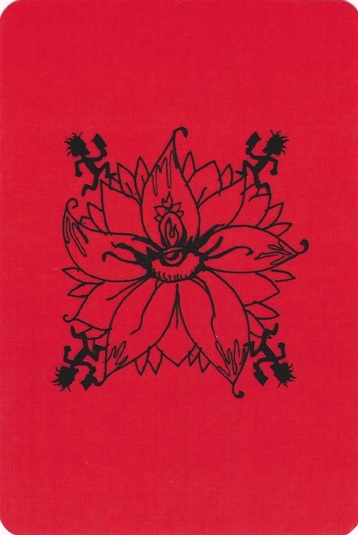 Self-published in the United States. I purchased my copy for $40 USD from the artist's Etsy shop on Sept. 14, 2012. 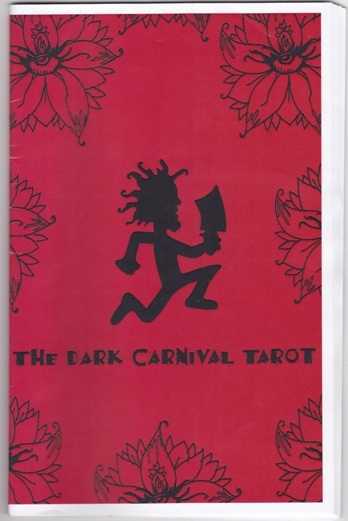 Seller's email is listed as darkcarnivaltarot@gmail.com. 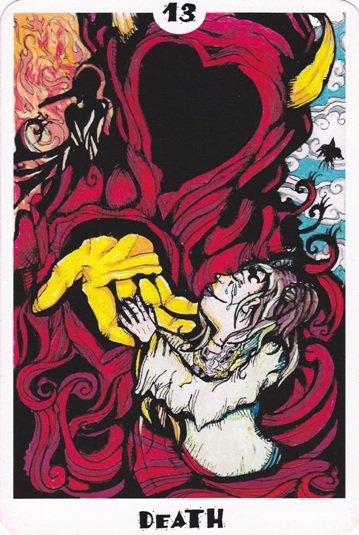 Rachel Paul (aka J-Rach), “Dark Carnival Tarot,” The Osborne Tarot Collection, accessed April 21, 2019, http://tarot.zerosummer.org/items/show/278.